If this also fails, yoi will need to manual install sanic from source. This is an example of running a service locally (localhost), using port 8899. Note: You might have to wait for 1 to 2 minutes in order to get some proxy ips populated in the database for the first time you use Scylla. 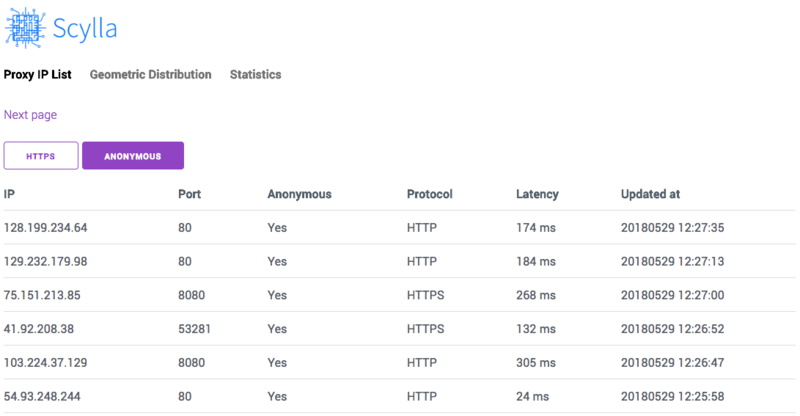 By default, Scylla will start a HTTP Forward Proxy Server on port 8081. This server will select one proxy updated recently from the database and it will be used for forward proxy. Whenever an HTTP request comes, the proxy server will select a proxy randomly. Note: HTTPS requests are not supported at present. Open http://localhost:8899 in your browser to see the Web UI of this project. You are welcomed to add more test cases to this project, increasing the robustness of this project. Scylla is derived from the name of a group of memory chips in the American TV series, Prison Break. This project was named after this American TV series to pay tribute to it. If you find this project useful, could you please donate some money to it? Apache License 2.0. For more details, please read the LICENSE file.